In November last year we introduced a new feature that allows you to plot a new route with another one in the background - very handy for tracing over sections of an existing route. We’ve had great feedback about this but some people felt that the feature was a bit too hard to find. To remedy this we’ve now added a new Trace a Route option to the menus at the top of each page (under the Create menu). Hopefully this will make this feature much more accessible. I can see how to trace a route over one that I have loaded, but how do I add additional routes to trace over? Great feature! Brilliant! Use this a lot for mapping alternatives when route blocked (locked gates!) for horse riders. BHS Scotland access. Great feature. How can I remove the old route that I traced, once I'm done with my new route? Once you've saved your route you can select CLEAR and choose the option to clear everytihng. Then you can reload your saved route - you can do this without leaving the page by searching for it using the universal search box at the top of the page. Excellent feature ! Having borrowed some routes from another site and imported them, they arrive without directions. 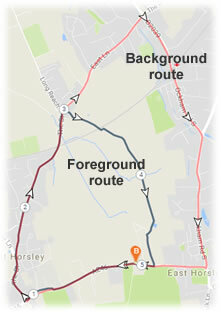 Using the trace feature makes re-creating the route and thereby creating Directions an absolute doddle !